Thoughts on Part 1, and Part 2. My thoughts are officially now in the Chozha time-period, roaming my ancestral towns and villages, and dreaming of wars and sudden ambushes. I am completely immersed in the story that sometimes it’s disorienting to come back to the real world. In the third part of this historical saga, the fanatic Pandiya association stealthily close in on their revolution to wipe out the Chozhas and claim the throne to avenge the death of their Pandiya King, Veerapandiya. Upon sensing the instability of their governance, the civilians are at unrest, threatening to react violently if their beloved Prince Arulmozhi is ousted. Making matters worse, no one knows if the Prince survived the storm. The witty hero Vandiya Devan shuttles between the royalties, trying to deliver important messages and wriggling out of sticky situations he gets into. 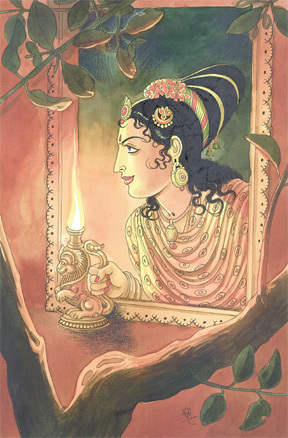 The conspirators diplomatically try to trap the Crown Prince Adithya Karikala, with the help of the dangerously bewitching young Queen, Nandini. Things seem to run out of control and the whole Empire is shrouded with an ominous gloom. I thought this volume dragged a little in terms of the plot. There were plenty of scenes which seemed superfluous, however they definitely contributed to defining the characters, and the extent to which they dictated the fate of the Empire. Stories within stories give shape to the significance of the historical elements, and they help us understand the motivations of the characters. I was really impressed by the secular attitude that the Chozha Kings and Princes adopted. Sundara Chozha and Arulmozhi Varma are shown to be patrons of Buddhism, in addition to being zealous Siva devotees. Once again, this volume brings out the magnanimous nature of the Chozhas, and their burning ambition to further their Empire. But, even conquests are not shown as ruthless acquisitions of wealth. This is probably the author's romanticized view, but it makes the story interesting. It’s nice to believe that my ancestral place was ruled by brave and benevolent dynasties. I read Part 3 of the book published by Macmillan India, and translated by C.V. Karthik Narayanan. This edition has simple illustrations interspersed within the pages, making it fun to envision characters. Speaking of which, here is a lovely illustration of the Chozha Princess Kundavai, by my talented friend. The translation by Karthik Narayanan was good and the editing was much tighter, although there were a couple of minor lapses. I thought some phrases were getting redundant, but that might just be due to the inadequacy of trying to represent one language through another. But overall, it was well-written. I enjoy reading all the poetic dialogues and references, and every now and then I can see through the translation and realize the actual Tamil lines and I congratulate myself gleefully :). Hopefully the fourth volume continues this trend, but teems with plenty of action!